Home Home Server How to configure CouchPotato V2? CouchPotato is a wonderful set and forget python script to automatically download and pass torrent files to torrent downloaders or NZB files to NZB downloaders. 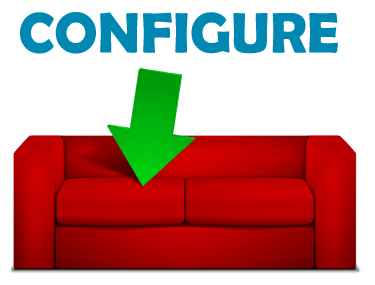 In this post, I will explain how to configure CouchPotato V2. It is essential to configure CouchPotato properly to make it work with SABnzbd for automate downloading movies. If you have not yet installed CouchPotato, please refer to my previous posts on how to install CouchPotato V2 on Ubuntu and install CouchPotato V2 on Windows. You will need news group access for best performance and CouchPotato works best with Usenet services such as Astraweb with SABnzbd or Unzbin newsgrabbers. 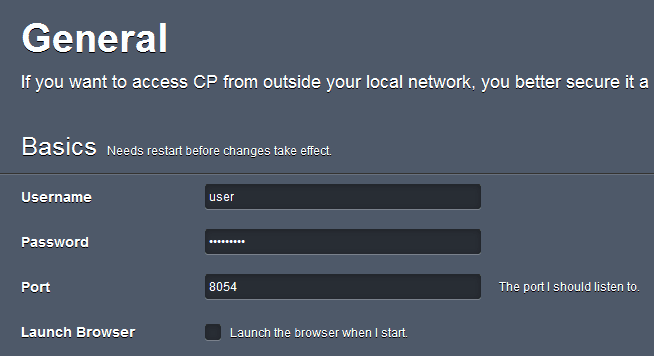 If you have successfully, installed CouchPotato on your system now its time to configure CouchPotato V2. The CouchPotato V2 web interface, with its dark theme, looks much better than V1. 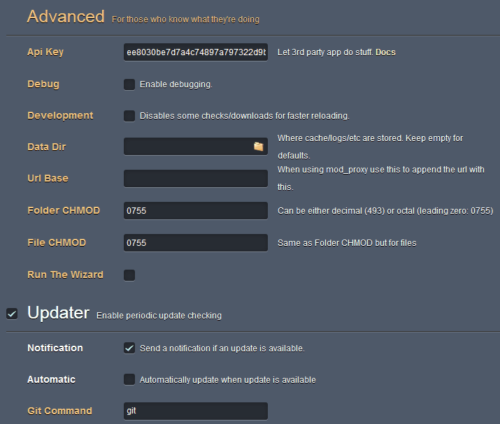 The first time you go to the webui, you will have to go scroll through and configure CouchPotato. CouchPotato offers you to import your existing database (data.db) either from previous installations. If you want to import the previous database find and select the data.db file. First, under general settings you may set the Username, Password, and Port. I usually like to not have anything work on its default port for security reasons. If you are like me, you may set a different port. If firewall is enabled on your system, then allow the port you select. Also enable port forwarding on your router if you want CouchPotato to be accessible outside your network (through internet). If you are running Linux and interested in setting up a DDNS client, check this post. Disable Launch Browser. This will stop the browser from launching every time CouchPotato is started. For example, if you are autostarting CouchPotato during startup, then the browser would launch automatically after the startup and take you to the home screen. At least to me, this was undesirable. Then configure CouchPotato with the downloading method. I am going to show the two most commonly used methods: SABnzbd and Transmission. CouchPotato works best with SABnzbd (Windows installation / Ubuntu installation). If you have SABnzbd newgrabber installed and would like to use it for downloading NZBs, then enter the Host, API Key, and the Category. If SABnzbd is running on the same system CouchPotato then the host is localhost. You can get the API Key from Config->General section of your SABnzbd web interface. 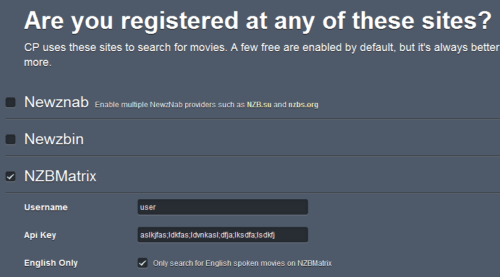 The category name would movies or whatever name you have for movies in your SABnzbd configuration. Transmission is an awesome lightweight bittorrent client with a feature-full web interface (Ubuntu installation). If you have it running, enter the settings bellow. Enter Host, Username, and Password information. Directory is the watch directory in which you want to save the .torrent. Transmission should be setup to automatically pickup .torrent files from this directory and start downloading. Alternatively, you may use qBittorrent or Deluge instead of Transmission as well. Just configure CouchPotato (choose “Black Hole” as the downloading method) to save the .torrent to their respective watched folders. 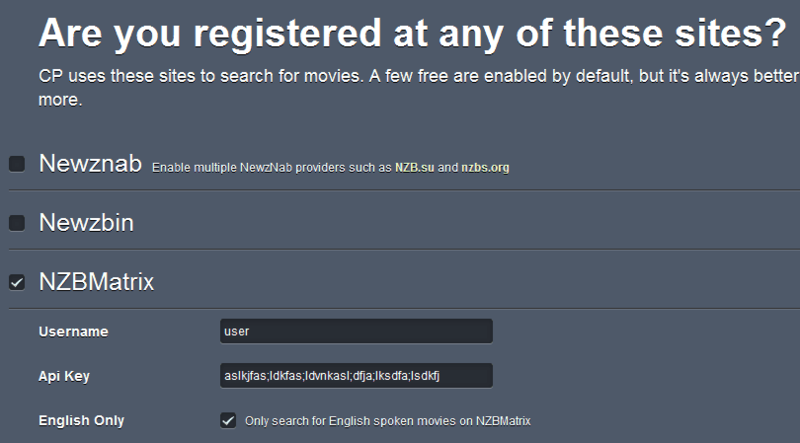 If you have created accounts with any of NZB or Torrent indexes, you may enter the details below. 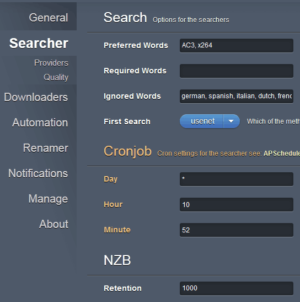 You can configure CouchPotato to automatically search and download .nzb and .torrent files from these services. After a download is completed CouchPotato can automatically rename the files and move them to a location of your choice. 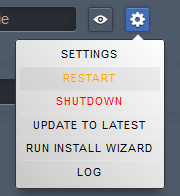 If you would like this feature, enable it and set it up as shown below. From is the folder where your completed movie resides. We recommend enabling this featured instead of SABnzbd's sorting feature. To in most cases is your movie library folder. You can customize Folder Naming. I chose the format Movie Name (Year).ext. For File Naming, I chose the format Movie Name-Cd1.ext. You can change it to your liking. We are almost done with the initial setup. Click the finish button. If you provided a Username and Password you may have to login. Restart CouchPotato for the initial settings to take effect. If you changed the Port you will now have to access CouchPotato interface through the new port. Now using the above menu, go to Settings to configure some of the advanced settings. 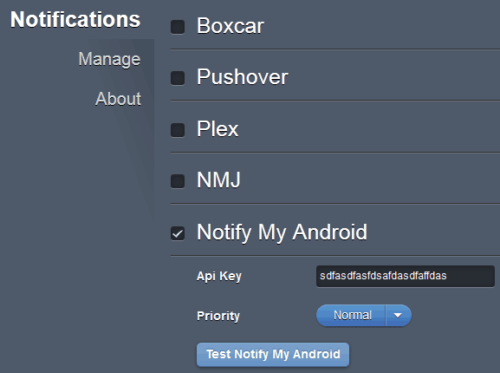 In Advanced under General settings, API Key is the authorization key for other apps to be able to control CouchPotato. If you use apps such as Qouch (on iOS), NZB Unity (Android), and MediaDog (Android) to remotely control and manage your CouchPotato, you may want to set and use the API Key. Under Searcher settings you may choose to further customize your search settings. 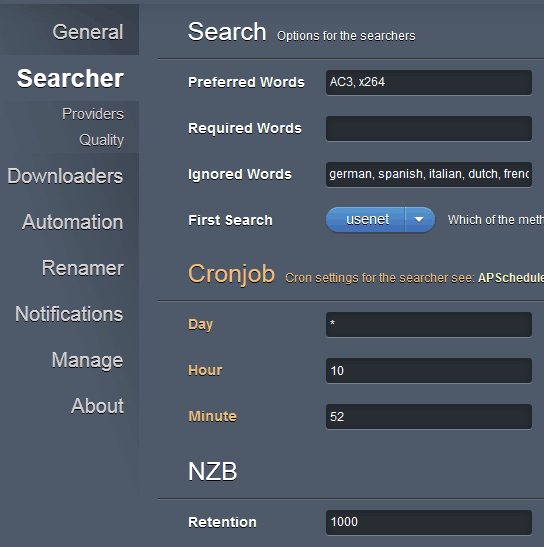 For example, you can specify preferred / required / ignored words while search for torrents or NZBs. 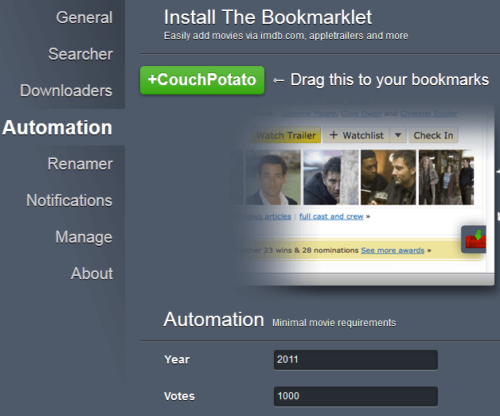 You can also automate your searching by having CouchPotato run a search at a specified time. You can leave the rest as-is unless you know what you are doing. You can further customize your previous settings on search providers. You can enable torrent and NZB indexes as per you preference. CouchPotato allows you to setup quality profiles. If you prefer only certain quality downloads such DVD Rips, BR Rips, CAM, etc. you may setup your quality criteria while searching. CouchPotato only downloads files that meet your criteria – it look for your files that meet your first quality choice, then the next one, and so on. How long CouchPotato will look for a certain quality is determined by the number of days you specify for in “Wait ___ day(s) for a better quality”. Remember that the size of the file that you download will dependent on your quality criteria. HD content is normally several GB, which will require a reliable unlimited Usenet account. CouchPotato also offers browser extensions and addon scripts that show an Add to CouchPotato option at the bottom of the screen automatically while browsing movies on sites like IMDB and RottenTomatoes. You can also configure CouchPotato to automatically add movies that meet your criteria. Be careful though, as CouchPotato may start downloading tons of movies if your criteria is too loose. Under Renamer, you have the option to download subtitles automatically if you choose too. For English, enter en. You can also configure Trailer downloads. The feature I like there is the Metadata for XBMC. If selected CouchPotato can automatically download Metadata (such as movie information, posters, fanarts, etc.) 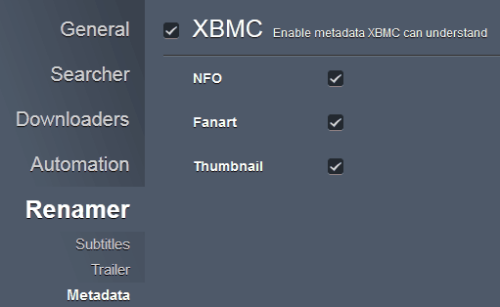 for your XBMC library. This completely automates you your media center. If you enable this in CouchPotato, then I suggest that you disable the rename/move option in SABnzbd as there may be a conflict. You can have CouchPotato automatically notify you when an event (eg. Download Completed) occurs. Several options are available for you to use: Prowl for iOS devices, Notify My Android for Android devices, and notification message on XBMC. We are almost done with the configuration. Finally, you can configure CouchPotato to automatically scan your library and check if a movie already exists in your library, before downloading. Add your current movie library folder to CouchPotato. And that is all there is to it. If you are interested in taking your setup one step further and have the ability to remotely control your CouchPotato using mobile devices, check this post. Install and configure CouchPotato and enjoy your automatic media center. How to setup CouchPotato on Windows from source?